“Lace” means bits of fabric sewn together with open spaces between the pieces. The lines of stitching hold the pieces together. You can get different effects depending on how you lay out the pieces and sew them together. This demo will cover the basic “how to” and share some examples. Will the back be visible? If so, don’t use prints. Use solid or fabric with a woven pattern. 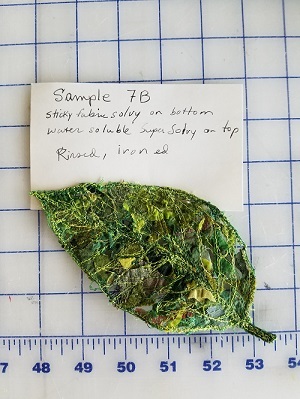 Any fabric—silk, wool, batik, cotton, anything! Will it bleed or shrink when it gets wet? Usually there’s some give in the threadwork so shrinkage isn’t a problem. Bleeding can be a design feature! Will it fray (like coarse wools)? If so, finish the edges before you stitch them into lace. Thread: usually, should have matching thread in the bobbin. Depends on whether the back will visible. If the design has big pieces in different colors, as you sew you may want to change thread colors to match the fabric. Sewing machine set up: straight stitch or free motion. Needle appropriate for the fabric. Random: overlapping is OK but if it’s too clumpy it will be hard to sew through. Advantage: it won’t matter if the pieces shift, or if there’s shrinkage. Planned: need to keep pieces from shifting before they are sewn down. I use pins. If lace needs to be a precise size, there may be shrinkage. 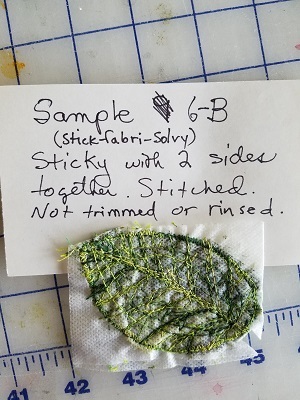 Do a sample first. Try the printable Sticky Fabri-Solvy. Sewing: Remember: fabric holds the stitches in place and the stitching holds the fabric in place. You can’t have one without the other. Think of your stitching as a grid. Edges—zig-zag with a row or two of straight stitches on top. Pieces of fabric should overlap the edge enough to give the stitches something to hold on to. 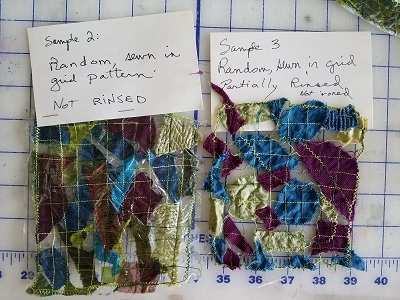 Innards—each piece of fabric needs to be stitched into the grid, ideally more than once. 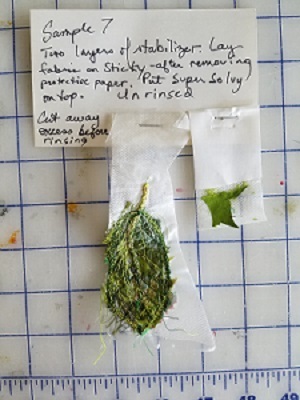 Random: sew back and forth up and down. Sew edges first. 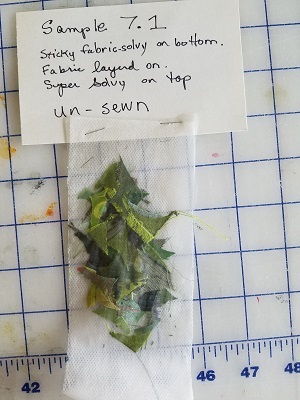 Planned: Sew the individual pieces of the design together (for example, the flowers, the leaves, the stems) then the edges. Add the grid to hold the layout together. Cut excess stabilizer away from edges. Save scraps for repairs. Rinse (or soak) per the manufacturer’s instructions until it’s not sticky. You may have to repeat the process to get everything out. Air dry if it doesn’t need shaping. Iron it dry, blocking into shape. Use a pressing cloth or paper towels on top (keeps your iron clean) and underneath (in case it bleeds). If it’s too stiff for what you want after ironing, rinse or soak again. If the wrong color thread shows on a design element, you can touch up with markers.